Our Love Affair with CSA - Happy Valentine's Day! we first met on the first farm I worked at. It was 1998 in the Berkshires and you were still a very young idea--I had never heard of you before until I was roped in to help pack bags up with a mix of delicious looking vegetables. how fresh all your vegetables were-- none of this trekking back and forth across the country in reefer trucks, but harvested and distributed all within a day. you and I have both been around and you've evolved and become so much more popular, for good reasons. You've inspired thousands of farms to embrace you and built hundreds of thousands of connections between farmers and eaters around the world. when we grow for you, dear CSA, we grow for members that we get a chance to meet, and we shape our crops to what our shareholders what want rather than what a distant grocery produce manager wants. Those members can visit the farm and be a part of enjoying the outside, which is what we most love and want to share about farming. CSA, you are always keeping it real. hopefully together, your true value keeps shining through. Sure, there are younger models of box kits coming in to try and edge you out, but we still see your real worth. And as you get older, we add more things to keep our relationship fresh and young--like movies and fruit and a bigger U-Pick garden. Want to start your love affair with CSA? We'd love to have you join us as a member! Sign Up for the CSA! This winter I’ve worked part-time for the Northeast Organic Farming Association of NY, which plopped me down into an office a couple days a week (okay, it was my farm office so there was a cute puppy distraction hanging around) and sent me around to a number of food and farm conferences. Spending days in cars and windowless rooms gave me a HUGE refresher glug of appreciation about our farm and how special and beautiful it is being outside and surrounded by growing things! Farms can be hectic and crazy places—we certainly know about stress between the weather, trying to cram a year’s worth of work into a six-month growing season, and the deep well of uncertainty and chance that lies at the root of farming… Will these seeds germinate? Will there be a hailstorm/drought/freeze/[fill in the blank with your disaster of choice]? Will folks want to eat the crops that we grow? But even amidst the chaos of farming, there are these amazing moments of peace that overwhelm you sometimes… like when you are pulling a late night to finish planting in the dark, with the deep blue sky perfectly highlighting the trees and then a shooting star flares down… or when you've been with the crew looking down all day weeding a field and then look up at the end of the day to the feeling that everything is perfect for a moment… or all the thousands of little daily unexpected gifts like the glimpse of an osprey catching a fish from the pond, a fifteen minute migration of hundreds of thousands of red wing blackbirds, or even just the peace of the crops waving in the wind. Things are crazy out there in the world now—we’ve talked with CSA members and market customers a lot about this in the past year. Things are so mean and toxic that many of us are tuning out social media and emails, which seems both understandable and healthy. We feel your stress, but at the same time as we join the crowd and tune out some things, we are also trying to figure out how to best share and spread the peacefulness and vitality of the farm. We want our veggies to carry the sense of growing happy, out in nature, bringing some of their wildness into the kitchen so that every bite has a bit of that farming zen, of some calmness and sanity in the midst of nature’s or our human world's chaos. And even more, we want eating vegetables to be a fun and relaxing experience, and not cause folks any added stress about how to handle or cook them. Make using vegetables less scary—we know some of you are kitchen pros, but other folks find using the veggies harder, especially when pinched on time. We know this first hand, because we too sometimes have weeks where it’s easier to eat a bowl of cereal or grilled cheese for dinner rather than making something from the amazing veggies we have piled all around us. That’s why we finally dredged up the nerve to start doing videos, especially in the kitchen. Videos have been one of our goals now for three seasons, but were intimidating because it involves being on camera (my phobia) and having a kitchen that doesn’t horrify all of you (it’s good now, but just wait till August rolls around). But since not everyone can make it to the farm or the market, we realized that this might be the best way to bring the vegetables to you. Also, on our personal sanity front, it takes a LOT of writing and thinking to get things like recipes or cooking techniques into words, and it’s so much faster to just demonstrate and record it! The challenge for us is that while we know our way around the kitchen, we aren’t really pros. But we hope you will be patient with us as we pick up where last year’s veggie charts left off to explore some of the delicious classic preparations of vegetables. We are looking forward to pushing our own culinary boundaries with you. Let us know if you have anything you struggle with in the kitchen or that you’d most like to see demonstrated and we will work on it for a future video! Make the CSA as easy as possible for all of us—Besides focusing more on hands-on kitchen prep, we’ve started streamlining our CSA signup and management process and have it all on our website now. As the season gets nearer, we will also add a “Members” page on the website so everything is easy to find and access. We also really enjoyed getting out to our remote sites last year and plan to do that more regularly this summer, where we can bring more extras to each site and get to see everyone in person regularly. We also are making the U-Pick garden our top priority this year—okay, I know that we said this last year, but this year we are putting one of our employees in charge of it, and their sole job one day a week will be to keep things all ship shape and boss us around to get things done. 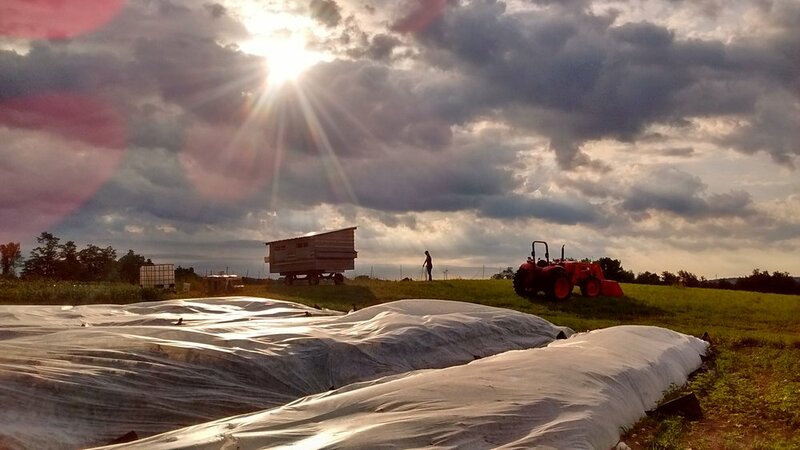 The U-Pick honestly has been a challenge the past two years, because in rough weather, we have to push it aside to keep the main CSA share crops going. What we really came to appreciate this past year is how the U-Pick garden has so much importance beyond picking a few flowers. It’s the chance for our community to come see the farm and experience some of both the vibrant chaos and amazing peacefulness that somehow peacefully coexist. And equally important to our own sanity, it gives us a chance to see the farm fresh through your eyes as you enjoy it at the end of your work week. And finally, we are hosting regular farm tours and three volunteer days this year for folks who have requested more time to get involved (thank you!). The regular monthly field tour will be one Friday every month during the U-Pick and CSA distribution, open to all who are able to come to pick some flowers and see what’s growing. We are also holding three volunteer days to help deadhead U-Pick flowers in July through September (the main task that overwhelms us that involves taking off the old flowers so that the plant keeps producing new ones, jam band music is optional). We would love to hear your feedback—we always love pictures and suggestions, because it’s so helpful to have a fresh set of eyes looking at things. Over the next few months you can also find us sharing all the peaceful moments we can around the farm on YouTube, Instagram, and Facebook, this blog, monthly emails, at the winter farmers markets, or come by and snowshoe if you want! Until later, we hope you have a peaceful day! Cheat Sheet for CSA Week 12! With the weather cooling off last week, the shares are taking a turn towards fall! Spinach, spaghetti squash, potatoes, carrots, kale, tomatoes, and more! Cheat Sheet for CSA Week 9! This week lots of tomatoes are starting to make their way into your boxes, as well as the farm's second most intensely polarizing vegetable: Eggplant! Enjoy! Cheat Sheet for CSA Week 7! This week lots of summer veggies are starting to make their way into your boxes, as well as the farm's most intensely polarizing vegetable: Fennel! Enjoy!